Last year was quiet compared to 2016′s bonanza. THE IRISH HOTEL property market reported a strong finish in 2017 – but the total volume and value of sales for the year were nowhere near 2016′s bonanza. 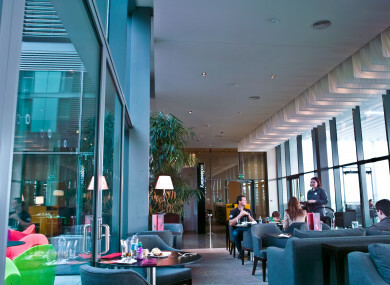 According to research from Cushman & Wakefield, the commercial partner in Ireland for Sherry FitzGerald, hotel deals worth just over €171 million were completed in the three months to December of last year. Total hotel sales for the year amounted to a combined €260 million, significantly lower than 2016′s record high of €720 million. However, Cushman & Wakefield analysts noted that 2017′s figure doesn’t include “unconventional hotel sales” that took place during the year. This included the acquisition of the Jurys Inn hotel chain, which was snapped up as part of a 37-hotel deal when it was taken over by Sweden’s Pandox and Israeli group Fattal Hotels in an £800 million transaction. Researchers also added that any loan sales, hotel refinancing deals and suites purchased within hotels were excluded from 2017′s tally as they are not considered “single-hotel asset transactions”. That said, the volume of hotel sales was notably down compared to recent years. Some 30 hotel transactions were completed in 2017. That’s compared to the 50-odd deals completed every year from 2014 to 2016. According to Cushman & Wakefield, the hotel market in 2017 largely consisted of small, single-asset purchases. Three in five transactions were for properties in the €1 million to €10 million bracket. 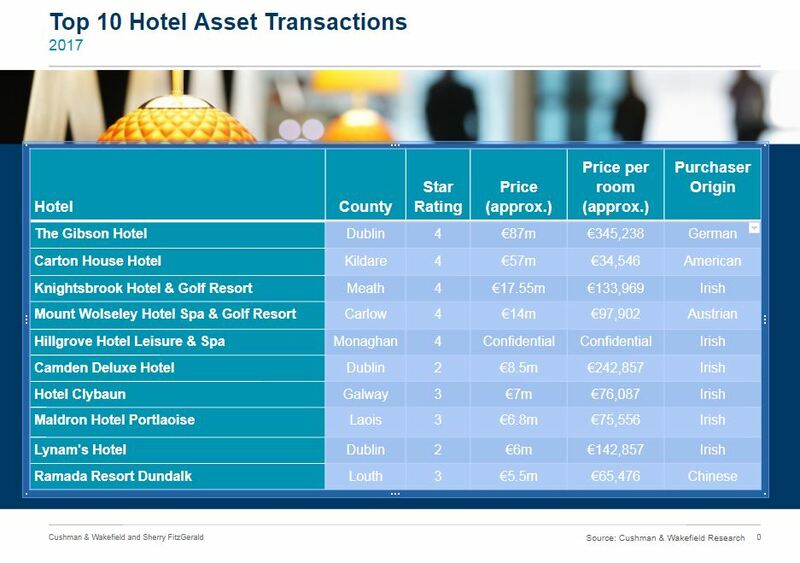 Nearly a quarter of the hotels sold last year were valued at €1 million or less. There was strong interest in hotels outside Dublin last year. The share of hotel sales outside the capital grew from 26% in 2016 to 58% last year. Just five hotels were sold in Dublin during the 12-month period. The biggest deal of the year was the sale of the four-star Gibson Hotel in the capital’s North Docklands area, just across from the 3Arena. It was bought by Germany-based asset manager DekaBank for €87 million. Last year, DekaBank bought the Clayton Hotel Burlington Road for €182 million, which was the biggest hotel transaction in 2016. The second most expensive hotel last year was the four-star Carton House Hotel & Gold Resort in Maynooth, Co Kildare. It was bought by Irish-American businessman John Mullen for €57 million. Another four-star property - Knightsbrook Hotel & Golf Resort in Trim, Co Meath - featured in the top five, selling for more than €17.5 million. It was bought by Ireland-based investment firm Blackbee Investments. Carlow’s Mount Wolseley Hotel Spa & Gold Resort and Camden Deluxe Hotel in Dublin rounded off the biggest deals in 2017, selling for €14 million and €8.5 million respectively. Looking ahead, Cushman & Wakefield believes 2018 will be a “promising” year for the Irish hotel market. It said the reduction in the capital gains tax exemption holding period – from seven to four years – for assets purchased up the end of 2014 “should result in a rise in further hotel re-trades”, the practice of a buyer renegotiating a property price after initially agreeing to pay a higher price. “Furthermore, the positive outlook for the economy bodes well for increasing tourism numbers, which are set to continue reaching record levels despite any slowdown in UK visitors from the weakness in sterling,” it said. Email “These were the biggest hotel deals of 2017”. Feedback on “These were the biggest hotel deals of 2017”.